A rather moving pop record with guest turns from Benmont Tench and Andy Summers. Regen is at his best when he plays it slow and smooth, as he does on “Delores”, a track aged in barroom smoke and 37 fingers of single malt Scotch. Its brilliance – thanks largely to an ace lyric from Regen – is embellished by some handsome B3 touches from the incomparable Benmont Tench. “One Part Broken, Two Parts Blue” perfectly captures late night loneliness and a dash of regret that’s enhanced by Rollings’ deft accordion work. Key among those best pieces is what may be the most obvious nod to jazz on Revolution, the penultimate number “Spirits of the Soul”, a track will doubtless garner comparisons to Sting: having Andy Summers adding typically lovely guitar figures to the piece may color those comparisons, but so be it. The more driving numbers – “Fighting for Your Love”, the closing “Run Away” – are by no means beyond redemption, but they are two of the less successful numbers here. It’s not so much that Regen sounds out of his depth as it is that they seem like unnecessary interruptions of what is an otherwise perfectly mellow mood. It would be easy to find fault with “Just Waiting For Now” for having been co-written by the ubiquitous Rob Thomas but it’s a nearly perfect piece of pop craftsmanship, as is “Excuse Me, But It’s Not Supposed to End Like This”, arguably the most complex display of Regen’s skills as a vocalist. And so there it is: a wall-to-wall celebration of song and masterful musicianship during which no one flails like a bebop whale on dry land and no one over-emotes to the point of irredeemable cheesiness. 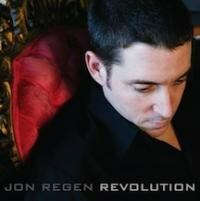 The real success of Revolution and the success of Jon Regen’s bold move forward as an artist and writer is that the record never strays from its conviction to honesty, never works too hard to please and, as a result, pleases all the more. Where Regen goes next as an artist and performer is anybody’s guess of course but if it be a continuation of what’s heard on this collection so be it. There are fates far worse than mastering the nuances of one’s craft, fates far worse than finding an audience that appreciates not only the pleasure that results from those efforts but indeed the intensity of the efforts themselves.